Chronic knee pain has a high prevalence in westernized societies, where osteoarthritis, ligamentous ruptures and meniscus injuries are on the top of the statistics. Scientists estimate that up to 25% of the adult population struggle with frequent knee pain (Jinks et al., 2002); every 4th adult person you’ll see on the street! Could malcompressive, imbalanced forces within the knee, be the real culprit behind chronic knee pain? In our experience; yes, absolutelyt! This article will address the most common causes of these injuries, and how to identify and treat the underlying dysfunction. This is a simplified version of my norwegian articles about knee pain. The knee joint is roughly made up of the femur (leg bone), patella (knee cap), tibia (shin bone) and fibula (calf bone) bones. Although the knee is mainly a hinge-type joint, it also performs gliding, rotation and side-bending to some degree. At the end of the femur we have the inner and outer epicondyles, fitting into the meniscus’ articular surfaces. If muscular imbalances or postural/habitual strategies cause the femoral condyle to load the meniscus unevenly, wear and tear may occur much more rapidly than it would under normal circumstances. As I said, although the knee is a hinge-joint by nature, it’s also capable of certain degrees of gliding, rotation and rolling between the femur and tibia. Muscular and ligamentous tension sees to that no excessive movement occurs within the joint, especially when in a loaded position. When the knee is bent, there is a significantly higher degree of rotation available in the knee, than when straight. Posterior gliding of the tibia usually occur when the knees are being locked back into hyper extension in posture. This postural deviation is often a secondary compensation to swayback posture, which you can read about HERE. When the knees are jammed backward, the hamstring can hyper activate to create posterior stability in the knee, so that they do not completely bend backward and rupture the PCL; it’s often a protective mechanism. Because of its attachments, the hamstring will then, over time, pull the tibia further and further backward, eventually causing excessive posterior tibial glide. This may be identified by palpating the transition between the femoral condyle and tibial plateau (the knee has to be straight and muscles relaxed), and you will feel a height difference (inward dent) when moving onto the tibia rather than a smooth straight transition between the two. This backward pulling of the tibia will cause quadriceps and patellar tendon to stretch more than normal, thus greatly increasing the friction of the patella gliding over the femoral condyle when the knee is bending, which may wear down the condylar cartilage and cause tremendous pain “deep within the knee”, often referred to as “patellofemoral pain syndrome”. Additionally, the posterior cruciate ligament (which restricts posterior glide of the tibia or vice versa) will stretch more and more as the tibia malaligns, and may ultimately strain or rupture. Simplified, we could say that this is an issue of imbalances between the muscles that pull the tibia forward (quadriceps, gastrocnemius) and backward (hamstring). One way of dealing with it, could be to stretch the hamstrings and train the quadriceps and calves. I’d recommend, though, that the postural corrections are additionally utilized; primarily by correcting the swayback posture and locked-knees. To “unlock” the knees, simply open them by a quarter inch and avoid falling back into full extension. They should not be bent, just opened slightly. Measure the rehab progress by repalpating the transition and seeing whether the difference between the two is closing in. The height of the patella will affect how well and symmetrically it can glide in the patellofemoral groove (trochlear groove). Several factors affect this, such as tibial gliding and rotations, and muscular function. If the tibia translates posteriorly, the patella is pulled somewhat downward. If it’s translated anteriorly, the patella will come somewhat upward. If the patella resides too far cranially, it may impinge the hoffa’s fat pad as the knee bends. When excessive, it may also cause it to rest outside of the groove, and thus resting onto the bone structures that isn’t covered with cartilage. This will, of course, greatly increase the risk of cartilaginous damage, and osteoarthritis. Guided by the evidence, it seems that there is much more trouble involved with patella alta, than patella baja, where the latter is only associated with schlatter’s lesions in a few studies. Genereally, there is little evidence regarding patella baja. The medial femoral epicondyle’s prominence tends to be slightly higher than the lateral one. Furthermore, the lateral epicondyle tends to have two prominent tubercles rather than one, which makes the medial epicondyle a more reliable landmark for measurement. To identify patellar height, you may evaluate the distance between the center of the patella, and the palpable prominence of the medial femoral epicondyle. The center of the patella should be in line with, or perhaps just slightly above or below the medial epicondyle. If the central patellar imaginary line is way higher than the medial epicondyle, this indicates patellar alta. If the patella resides too high, the tibia may be translated forward. In such case, posterior tibial gliding (which will be dealt with shortly) may help the patella to come down a little bit. If the tibia is not forward, or even backward, this is indicative of patellar tendon laxity. Prolotherapy will likely be the next best treatment strategy, along with identification and removal of any habits (such as a tendency to sit in the office with maximal knee bend all day, and similar). You may also want to find out whether or not the quadriceps is strong and tight, or weak and tight. If it’s weak and tight, it requires strengthening. If it’s strong and tight, stretch it. A muscle test along with palpative evaluation of the tissue may guide you to such an answer. If not, just try one of the above; it probably won’t make a huge difference anyway. On the other hand, if there is patellar baja, releasing the patellar ligament along with strengthening of the rectus femoris and the rest of the quadriceps muscles may be beneficial. Also, if there is posterior glide of the tibia, the gastrocnemius may be strengthened as well, as therapeutic intervention. Patellar alta is the most common, and sadly also most difficult scenario to treat, as we can not merely strengthen the tendon. Habitual correctives, simple strengthening exercises along with prolotherapy is most probably the viable route to go. It is important to mention, though, that even if a [very] cranially positioned patella is found, it may not be the cause of the pain. A full examination is necessary in order to include or exclude differential issues. Functional knee varus is one of the utmost common causes of knee pain, in my experience. This strategy will place uneven loads upon the medial and lateral meniscus, where much greater loads will be imposed on the medial meniscus, and the lateral meniscus will somewhat unload. The most common cause of functional knee varus, is posterior pelvic tilt (PPT), which is one of the most misdiagnosed and unidentified postural abnormalities out there (learn how to deal with this in the same link as with swayback posture). PPT causes constant abduction and external rotation of the femur, which places continuous misloading onto the medial meniscus and locks the knee in maximal internal tibial rotation. Over time this may lead to injury of the medial meniscus, and even osteoarthritis. (Functional valgus, which is more rare, will cause the opposite; lateral meniscal injuries). This can be a brutal combination in my experience, often causing chronic injuries and pain in the joint. The varus positioning of the knees will also cause shear forces between the lateral femoral epicondyle and the IT-band, and when this shearing becomes great enough, a so-called “adventitious bursae” may develop between the IT-band and femoral epicondyle in order to relieve the friction, causing chronic runner’s knee syndrome. In other words, solving functional knee varus will also resolve chronic runner’s knee syndrome. The rotation within the knee is relatively easy to measure, but the functional varus-position is often quite subtle and not easily identified (ref. figure 5). I usually ask the client if they feel that they are “pushing the knees” or “hanging/slouching the knees” outward in posture. They’ll need to think a bit, but often conclude that yes, they do. If the client’s knee is jammed in maximal internal rotation, they usually have functional varus knee posture as well, which is why these traits are within the same subheading. The rotation between the femur and tibia is measured by comparing the position of the center of the patella, to the tibial tuberosity. The tibial tuberosity should NOT be lined up with the mid-patella; it should be approximately 25% more outwardly rotated. Figure 6 represents a typical “internally jammed” knee joint, where the tibial tuberosity is directly centered with the patella. Once again, it should be about 10 degrees more externally rotated, to line up vertically with the 3:4th lateral position of the patella (like this). To fix this we firstly need to get the person out of posterior pelvic tilt. This alone will often cause immediate adduction and internal rotation of the femur, but it’s often a good idea to supplement with exercises for the muscles that furthers the reversal of the dysfunction. Measure the rehab’s progress by checking the alignment between the tibial tuberosity and patella, pelvic alignment, and whether the person is able to utilize the TFL, adductors and peroneus longus during walking and other knee loading activities. Another common cause of knee varus, is pushing the knees too far out in the squat and similar exercises. A common misconception is that the knees should be pushed “torqued” as far out as possible. I see so many patients wreaking havoc on their knees due to this harmful cue! 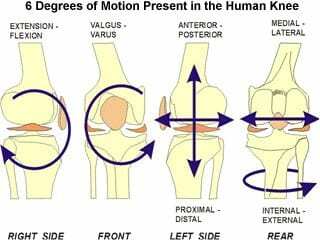 The knee’s optimal position depend on the relation between foot and femur. It’s too big of a subject to address in detail in this article, but generally you’ll want to point the knee toward the #2nd toe if your foot is flat, and if you have a higher arch, you’ll want to point the kne toward your big toe. Optimal knee tracking is MUCH more adducted than most people think! Here’s an illustration of how the knees and feet should be aligned in the squat. Figure 8 has pretty close to optimal knee positioning in the squat; the feet and femur are rotated in the same direction, with the knees pointing at the big toe. The only small detail is that the foot is too flat, but it’s the best illustration I could find. Another fact is that excessive “pushing out” (varus) of the knees, will inhibit the adductors. Many do not know this, but the adductors are powerful hip extensors, and functional knee extensors (due to fixated tibia) in the squat, and thus act as synergists to the glutes and quads. This is why you see many of the asian weightlifting champions go into (excessive) knee valgus on the squat’s ascent (not recommended). Either way, proper knee alignment is a winning combo both with regards to injury prevention and to performance. By now everyone knows that allowing the knees to fall too far in, is detrimental. However, there seems to be no real consensus of what is truly neutral, in the exercise community! Hopefully this article will clear up some of the confusion. This is the real cause of jumper’s knee; a too anteriorly positioned tibial bone. The tibia can translate forward due to several reasons. The most common is hyperactivity of either the calves or quadriceps, which usually occur if the person if gripping (clenching) their calves or quads posturally/habitually. A weak popliteus will also allow the tibia to translate forward. It is usually weak because excessive foot pronation and medial femoral rotation occurs in posture and gait. Addressing both the causes and the symptoms (muscle weakness) is therefore often necessary. When the tibia translates forward, it alters the angle of which the patellar tendon is pulled, often to such a degree that it may grind the patellar tendon into the tibial plateau as well as the infrapatellar bursa, causing constant wear and tear when the knee is bent. Secondly, it can strain the anterior cruciate ligament (ACL), which restricts anterior translation of the tibia. It simply can not do this, over time, if not being adequately helped by the hamstrings. To identify anterior tibial glide, similar to posterior glide, palpate the transition between the femoral condyle and the tibial plateau; it’ll feel prominent, and sticking out compared to the femur. The degree of translation varies, and is something you’ll need a bit of experience in to properly evaluate. It should, however, be a very smooth transition between the two; so any posterior or anterior glide means that there is room for improvement. Correction is relatively simple. Stretch the quadriceps and gastrocnemius, train the hamstrings and popliteus muscles. There could be underlying reasons of hamstring inhibition, such as inadequate hip extension in gait, but this is once again too complicated for this article’s purpose. As with posterior glide, it will also be beneficial to stop clenching the quadriceps and/or calves in posture. Now, this one is a little more rare. A too outwardly rotated tibia (or inwardly rotated femur) will cause faulty tracking of the patella in the patellar groove, causing it to grind into the lateral (outer) aspect of the condyle. This condition is often referred to as “chondromalacia patella”. Once again, as seen in the illustration below, we use the center of the patella and tibial tuberosity as landmarks for measurement. If the tibial tuberosity is vertically in line with the lateral edge of the patella, or further than that, this is a positive indication for excessive lateral tibial rotation. Once again, measure the rehab’s progress by using the landmarks of the knee. You’ll want the tibial tuberosity in line with the 3:4th lateral aspect of the patella (ref. illustration that was linked in the opposite subheading). Knee pain is very common. Thankfully it’s possible to reverse the causes of the condition as well as the symptoms, in most cases, if one is able to identify and correct the imbalanced forces in and around the knee. In my experience, the utmost common underlying causes of chronic knee pain, is posterior pelvic tilt and functional varus-position of the knees. These are both very subtle biomechanical factors that most of the time remain unidentified by the majority of therapists. I hope that this article has shed some light on these conditions and on how to treat them. Stop pushing your knees too far out. Rather, point them toward the big toe. Unless your foot is extremely flat, then point it to the second toe.